"Like other media since the Renaissance – in particular, perspective painting, photography, film, and television – new digital media oscillate between immediacy and hypermediacy, between transparency and opacity." argue Jay David Bolter and Richard Grusin in their book Remediation. After reading their thoughts it is difficult not to notice to which degree a work of art or a media product represent our desire for immediacy or our fascination with hypermediacy. Some days ago I saw a documentary about copyright called RIP! : A Remix Manifesto, where the musician Girl Talk played a main role. Both the movie, which were a mash-up of already existing films, and Girl Talk's music, which is based on samples from hits, are examples of hypermediacy. In both cases we get aware of how they are made, and of the medium. As Bolter and Grusin say: "If the logic of immediacy leads one either to erase or to render automatic the act of representation, the logic of hypermediacy acknowledges multiple acts of representation and make them visible." Hypermediacy and immediacy are interesting concept in relation to different exhibition technologies and different preferences for exhibition design. Do we want immediacy when visiting a museum, where we forget about the medium chosen to tell us a story? Or do we want to be aware of the medium and the constructedness of the story we are told? The danger with hypermediacy is that the medium becomes more interesting than the content. 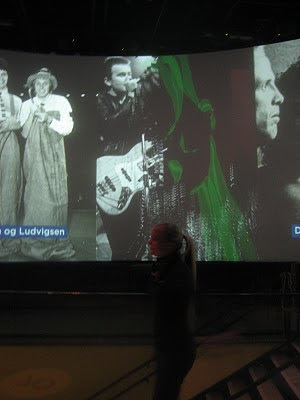 Many would probably argue that the exhibition at Rockheim suffers from hypermediacy. In this exhibition the media technology that are used, and the act of remediation, are many places much more visible than the content. At least, I felt so when trying to use the installation that introduces the exhibition. On six large screens you get introduced to the six decades the exhibition deals with. Each screen shows an image of a norwegian band or artist. If you move in front of one screen the image "breaks" into small pieces. If you continue until you have removed the whole image, a music video of the band on the image starts. To start a new song on another screen you have to first end the song you started by moving in front of a cross that appears on the screen with the music video. Through history, the interest for immediacy and hypermediacy has shifted back and forth. This is also visible in the history of exhibition design. One example is the introduction of the diorama, which is one example of an exhibition technique with the purpose of immediacy. The diorama was developed to make exhibitions feel as real as possible. Often, sound effects has been added to intensify the experience. But, where are we now when all sorts of digital media are more and more present in exhibitions? Do museums make exhibitions where immediacy is the desirable? Or do the museums' attempts to be modern and interesting make the museum visit a hypermediated experience? And what is in fact preferable? Bolter, J.D. & Grusin, R., 1999. Remediation - Understanding New Media, London: The MIT Press.